ABOVE: A 15 sec. exposure from Baltimore Woods. (1) Sirius in Canis Major, (2) Orion, (3) The Hyades (the head of Taurus the Bull), (4) Jupiter, (5) the Pleiades, (6) The Moon. The sky opened up for a crisp and clear viewing session late in the day after a long spell of heavy cloud cover on Saturday, March 16th. I made it to Baltimore Woods just in time for Bob Piekiel to direct me and my pair of Zhumell 25×100’s to the low-Western Horizon to take in Comet pan-STARRS (C/2011 L4, that is) with a light amber coloring and even a slight vertically-pointing oval that became an obvious tail at low magnification. This view only seemed to get better Sunday night (17th), where the comet was Naked Eye from downtown Syracuse! 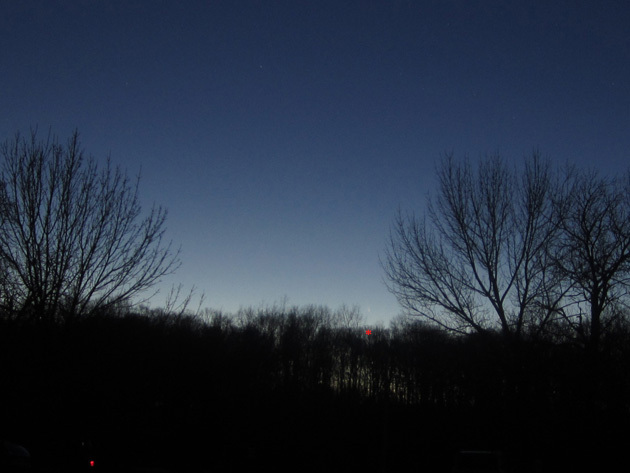 A horizon view of pan-STARRS is shown below (above the red asterisk. Canon DS1400 IS Digital Elph, 15 second exposures). Click on the image for a larger view. A time lapse of pan-STARRS setting below the Western horizon at Baltimore Woods is shown below (starts below the asterisk at left. Canon DS1400 IS Digital Elph, 4x zoom, 15 second exposures). Click on the image for a larger view. A view through the Zhumell 25×100 binos is below (by way of some fancy camera balancing). Click on the image for a larger view. A growing number of people are reporting that they can see Comet Pan-STARRS with the naked eye. Best estimates place the magnitude of the comet at +0.2, about twice as bright as a 1st magnitude star. As the comet moves away from the sun, its visibility is improving. Observing tip: Step outside about an hour after sunset and face west. 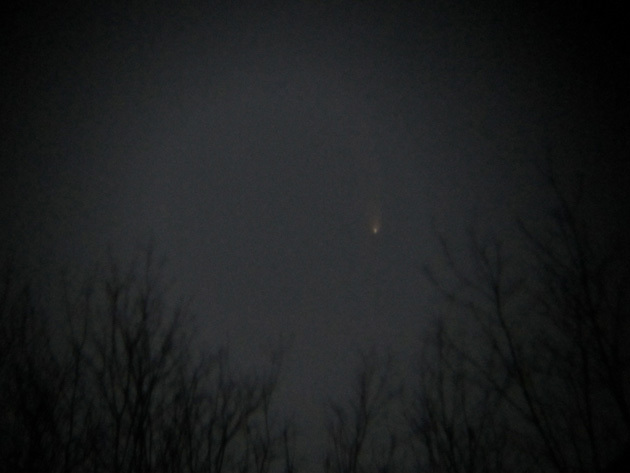 Pinpoint the comet using binoculars. Once you know where to look, put the optics aside and try some naked-eye observing. 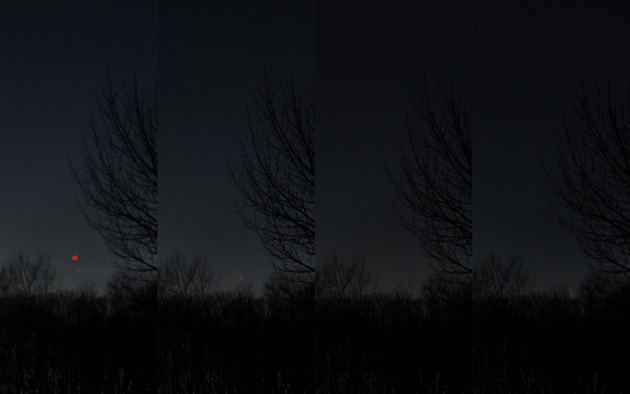 By the time pan-STARRS set below the horizon, the sky was quite dark and extremely transparent. Bob and I proceeded to play for an hour with his 11” SCT, new Meade 5000 super- and ultra- wides (24 mm and 40 mm), and my personal favorite, his Collins Image Intensifier (which does exactly what it describes – increasing the brightness of objects in the eyepiece and, in many cases, making observable a dim object you might otherwise completely pass over without knowing it was there – you can see some example images here: darkerview.com/wordpress/?tag=intensifier). * Jupiter (just to the right of the Hyades, as Taurus exchanges its otherwise brightest left eye (Aldebaran) with Jupiter as its right eye). Having given Jupiter considerable scope time this year already, we checked it mostly just to confirm it was still there. * Messier 45 – The Pleiades served as an excellent cluster for testing Bob’s new focal reducer (which, basically, increases the field of view). 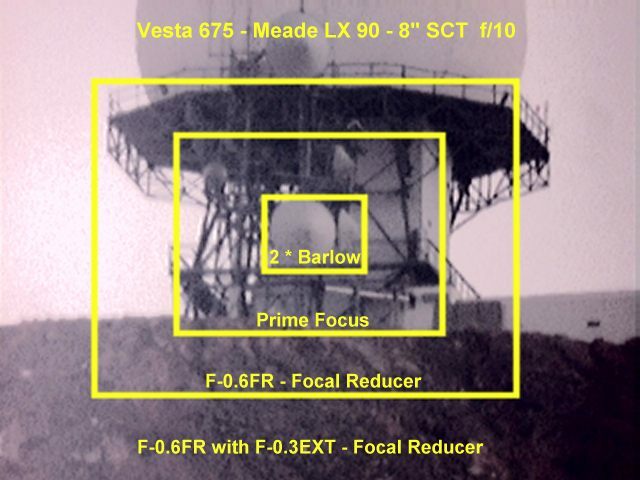 An excellent image showing what the focal reducer does is shown below (from webcaddy.com.au/astro/f-066fr-pics.htm). * Messier 42 – The Orion Nebula (without and without enhancement, with the Collins brightening and increasing the extent of the nebulosity). The Orion Nebula is the brightest and most expansive nebula observable from Earth and it sets earlier every day, so we spent considerable time on it before missing it all Spring and Summer. * The Andromeda Galaxy (M31) and Messier 32 – The intensifier brought out the presence of the central core of Andromeda but did not significantly enhance detail (specifically the dust lanes and spaces between the spiral arms that one can see in any eyepiece in dark skies). This was likely due to the presence of the Moon nearby in the sky (which can do a significant number to nebula and galaxy detail even when only present as a sliver), but I did learn some more about the intensifier eyepiece (see below). M32 (one of M31’s satellite galaxies) was also bright but featureless. * Messier 65, Messier 66, and NGC 3628 – All three galaxies in The Leo Triplet were excellent in the intensifier (and in the same field of view) despite the Moon. At the first Inner Harbor session, M65 and M66 were just visible (due to the the light pollution around the site) thanks to Ryan Goodson bringing a 16” New Moon Telescope Dobsonian. * Messier 35 – an open cluster nearly the size of the full Moon, containing a few bright stars and a tight grouping of dimmer ones. The intensifier has a tendency to “haze” a bit around these tight groupings as the pixels on the CCD chip begin to oversaturate. * Messier 41 – While observing this open cluster, the over-saturation of the CCD chip became obvious in the form of perfectly circular discs around each of the brightest stars, making each appear to have a well-defined nebula around it (not that these stars need any kind of image enhancement to see clearly in any scope. As you might guess, brighter star = bigger + brighter disc). Caldwell 14 – The Double Cluster – in the same way that stereotypical night vision goggles give you only shades (or different intensities) of green, the intensifier sacrifices color for “green intensity.” Accordingly, the reds, oranges, and blues in the Double Cluster that make it such an interesting eyepiece object go away, leaving you with just (well, not just) two dense star clusters. This is the best argument for intensifiers being used as tools for galaxy and nebulae hunting. Messier 81 – NGC 3031, Bode’s Galaxy – An excellent sight in the intensifier despite the crescent Moon (which would otherwise make it nearly featureless). Messier 82 – NGC 3034, Cigar Galaxy – M81’s gravitational neighbor (with M82 being the smaller neighbor and, therefore, more gravitationally influenced by M81). M82 appears to have two distinct cores in the intensifier (that would make it look like two galaxies about to merge). I attribute this double-core view to the intensifier picking up the massive filamentous structure perpendicular to M82’s galactic plane – but should buy my own intensifier to study it in more detail!). Messier 97 (Own Nebula) + Messier 108 – Admittedly, Bob and I kept passing M108 while trying to find M97 and failed to recognize it as M108 (faint but pleasant in the intensifier). That said, M97 was a very difficult find despite Bob bringing a GOTO scope and, by the time I confirmed to myself that I had it in the field of view, I was under-impressed with the intensifier view (it was barely an object with averted vision, although some part of this could have been the Moon’s presence). We closed the session around 9:15 p.m. by returning to the Orion Nebula for one last comparison of the intensifier and the Meade 40 mm. Lessons for the evening: (1) Don’t assume of comets! And, if you observe, report to the group so others know to also not assume! (2) Just because you’re freezing cold doesn’t mean you should stand 1/2 inch from a portable propane heater. At what feels like cryogenic temperatures, your leg goes from 10 F to 150 F before your nerves notice it. Hi All, That’s a gret summary of our observing session at Baltimore Woods last weekend. All your (Damian’s) notes were spto-on. I have been puzzling over why M97 was so incredibly faint as to be almost invisible, just as it was last month when Ryan tried it with his 16″ and again I tried to see it with my Go-To 11″. I have come to the only logical conclusion: The aliens living in that solar system must have built a Dyson Sphere around the star!